Thank you to Julie for emailing me this find! 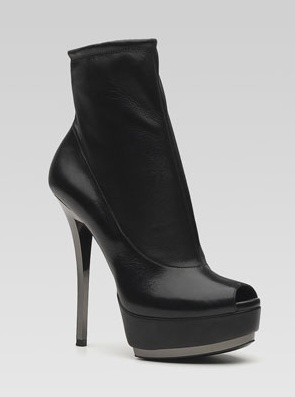 Gucci's Kills platform stretch leather bootie retailed for $990 but is no longer available at Bergdorf Goodman. Colin Stuart from Victoria's Secret has a great (more wearable) alternative that retails for a much lower $69. They come in both white or black and you can click on the photo below for more information. *Update - 10/14/10* - Chinese Laundry also has a similar bootie which retails for $39.94 at DSW. Click on the photo below to view or purchase this great look 4 less option. Dying over those Gucci's. The VS version is super cute too!